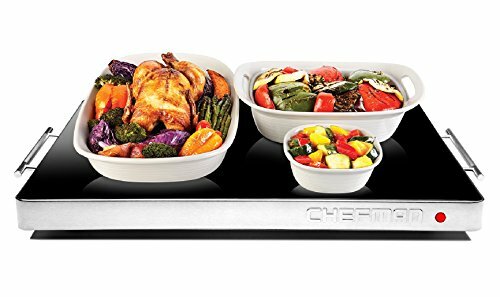 It’s not a party without the Chefman warming tray! Elegantly styled with a revolutionary, easy to clean glass surface. Generously sized, it holds several dishes at once and looks great on any table or buffet. The adjustable temperature control and the fuse safety feature keeps the electric tray from overheating so you can keep your food warm throughout the whole day. You can keep the warmer it on low for it to keep food warm all day, or adjust to high to warm your appetizers quickly. Perfect for entertaining the family during the football game on Thanksgiving Day or for everyday use. Extended side handles for safe transport - bring your food straight from the kitchen to the dining room table. Intertek tested for safety. Backed with the Chefman warranty. FAMILY SIZE WARMING TRAY: The 21" x 16" surface hot plate can fit several dishes at once and looks great on any counter top, table, or buffet. The adjustable temperature control and size makes it suitable for family dinners, Sunday football gatherings, holiday meals, or other big parties and events. KEEPS FOOD WARM ALL DAY: The adjustable temperature settings make it easy to quickly heat up your food, while the fuse safety feature keeps the electric tray from overheating so you can keep your food warm throughout the whole day. You can keep the hot plate on low to keep food warm throughout the day, or adjust to high to heat your appetizers quickly. Should not be left on for longer than 72 hours.